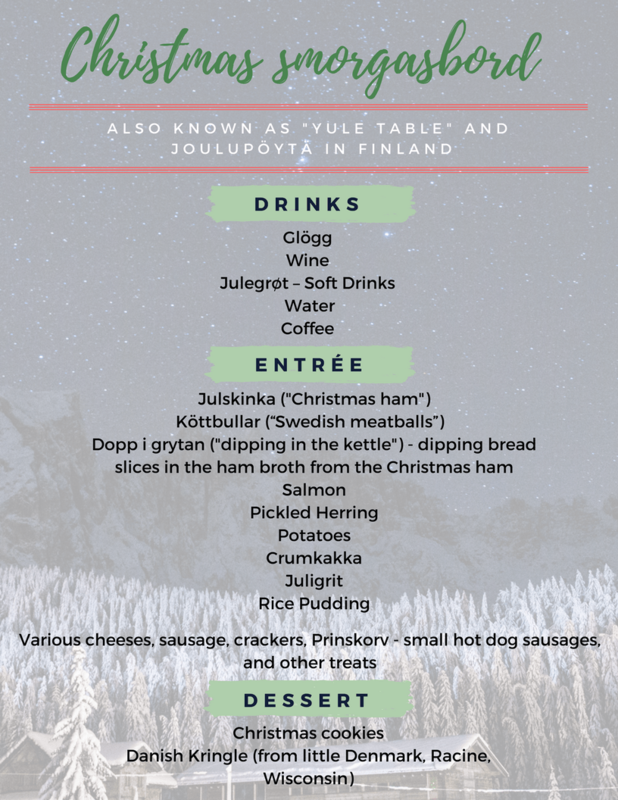 The land of ice and snow, of warm-huddle-fires and reindeer, Scandinavian is as close to the Christmas idyll as one can get – and the Sons of Norway and Scandinavian Trade Association are planning a to offer a fun evening of food and fellowship celebrating the various Scandinavian Holiday customs. In Sweden, the Christmas season officially kicks off with the celebration of St Lucia Day on the 13th of December and this year the julbord will be a traditional buffet. Some of the members are bringing special foods for the event and everyone is welcome to bring a dish or desert to share! Program from 7:00 to 8:00 P.M.
Fellowship until close at 9:00 P.M. Thank you for a wonderful event. Check back for 2018 dates!